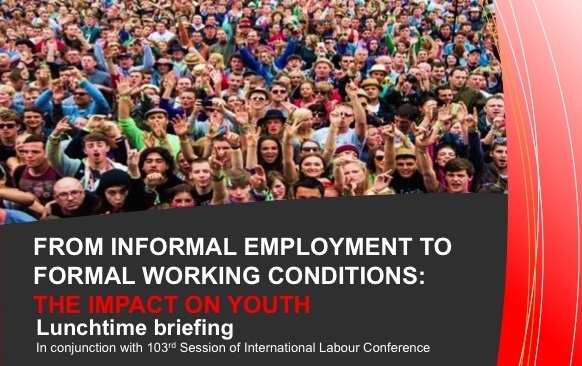 A lunchtime briefing titled “From Informal Employment to Formal Working Conditions: The Impact on Youth” was held on June 4, 2014 at the Centre International de Conférences de Genève in conjunction with the 103rd Session of the International Labour Conference. The International Catholic Center of Geneva, the International Coordination of Young Christians Workers, Kolping International/German Commission for Justice and Peace, and Caritas Internationalis organized the event in collaboration with Caritas Genève and Women in Informal Economy: Globalizing and Organizing (WIEGO). This briefing intended to identify windows of opportunity for Civil Society organizations interested in the topic of transition from the informal to formal economy for youth as well as to draw the attention of international organizations to the local perspective, allowing a better understanding of initiatives occurring on both local and international levels. Ms. Hildegard Hagemann (Kolping international/German Commission for Justice and Peace) chaired the briefing, giving the floor to several distinguished panelists. In her opining remarks, Ms. Maria D’Onofrio (CCIG Secretary General) pointed out that this event was one among several initiatives undertaken by the organizing NGOs since 2010 in order to promote Decent Work for different vulnerable groups, including domestic workers. In particular, an NGO Consultation on the youth employment crisis was held in 2012 (See Outcome Report). Ms. D’Onofrio highlighted how the international community and all relevant stakeholders have clearly recognized that today youth are facing multiple challenges regarding the implementation of their human rights and the realization of those social and economic conditions that would allow youth to live fully and in dignity. Since these challenges are global and very diverse, CCIG is committed to create spaces to promote exchanges involving actors with different expertise in order to tackle the current situation of youth in the most effective way. The first panelist, Ms. Maria Prieto (Youth Employment Specialist – ILO) presented the framework for ILO actions on the topic, recalling that ILO resolution stemming from the International Labour Conference (ILC) in 2012 urged States to take actions in order to face youth employment crisis. 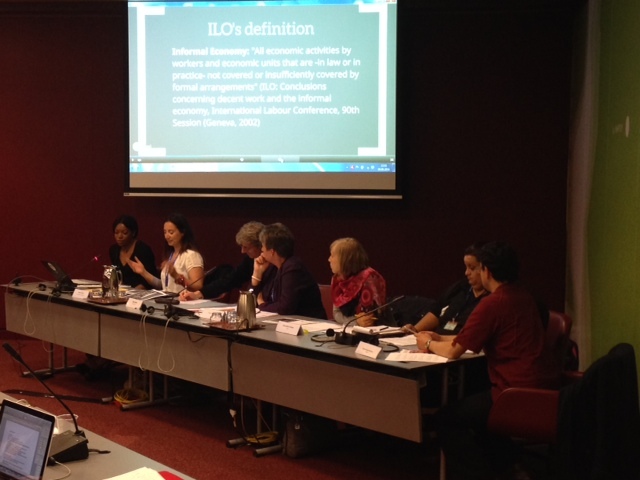 Accordingly, ILO produced specific research papers to highlight the trend of youth employment. While the standard setting topic of the ILC in 2014 is the transition to formal economy in general, the young population is also largely concerned by issues related to formalization. Ms. Prieto observed how the issue is very sensitive –as proved by divergent positions between employees and employers– and nevertheless needs to be addressed since the situation is worsening worldwide: according to ILO statistics, 8 out of 10 young workers (aged between 15 – 24) are currently out of the formal economy. This situation assumes different connotations depending on the regions concerned: in developing countries there is often no alternative to the informal economy, especially for young people, which implies exclusion from professional careers and social protection; in developed countries deep concerns are raised by the number of highly qualified youth being underemployed. Next to take the floor, Mr. Niels Bohr (Representative from Caritas Genève – member of Caritas Internationalis) shared his experience in concrete initiatives carried out at the local level. While recognizing the differences between the situation in Geneva and in some African countries such as Cameron, DRC and Rwanda, he stressed out a similarity in the vulnerability experienced by young people in accessing the labor market. With regard to the situation in Geneva, Mr. Bohr observed that lack of adequate training is among the main causes for poverty and consequent social exclusion among young people. Specific interventions have been, therefore, realized by Caritas Genève in order to offer adequate training and motivation to young people who are struggling to find employment. The partnership with the State and the private sector has been a key factor. Specific educational programs have been undertaken also through projects carried out in several African countries, where high dropout rates and low quality education are among the main causes of the difficulties encountered by youth in terms of access to decent work. Rural areas are particularly concerned and young girls are the most vulnerable sector of the population. As a result, many youth are employed in the informal economy or get involved in criminal activities. In this context, several efforts have been made by Caritas Genève in order to make youth catalyst for the development of their own communities. Ms. Anna Chiara Bruno (Representative from ICYCW) presented the perspective of a young people organization that is working both at the local and international levels to bring the voice of youth in the international fora and share good practices for making decent work for young people a reality. Ms. Bruno presented the experience of YCW in Italy in initiating a campaign titled “Sommerso: riporta a galla il tuo lavoro!” (i.e. : “do not hide your illegal work, but tell us your experience”) in order to assess the impact of youth’s informal work on the society. The campaign involved both Italian citizens and migrants, since many young people coming from East Europe or outside Europe represent a large number of the informal workers in Italy. According to statistics, about 3 millions of workers have no employment contracts in Italy. In response to this situation, ICYCW is working to promote international solidarity, in order to share good practices and learn from the experience of other countries. With regard to concrete actions, more emphasis should be given to the active participation of young people in the decision making process at the national and international levels, especially when decisions have a direct impact of the young population. Moreover, further awareness raising activities are needed in order to sensitize young people on the risks of informal work and the advantages of a regular job (security, social protection, etc.). Finally, Ms. Paola Caviedes Martinez (Representative from WIEGO) shared her experience as waste-picker in Argentina. Despite the fact that waste-pickers are over 40,000 in Argentina and 20 million in the world, playing an important productive and environmental role, they are not yet fully recognized as “workers” by Governments, trade unions and the society at large. They are confined in the informal economy. Within the broad group of those who are excluded from the formal economy, Ms. Caviedes stresses that women and children are those who suffer the most. In particular, young women need to recycle but also take care of their children. On the other hand, the lack of social protection for the young parents produce a very negative impact on the children themselves: since they are raised in the informal and unorganized sector of the waste pickers, these children are more prone to abandon early their studies in order to get an (informal) job and contribute to livelihood of the households. 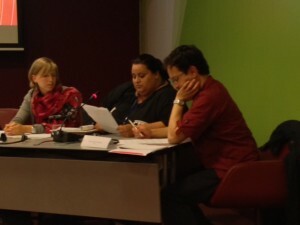 Presentations from the speakers were followed by a debate with the participants. Main questions raised concerned the possible coordination among UN agencies in order to tackle informal work for young people; existing disparities in the age range for youth according to different UN bodies; the strong link between child labor and youth’s informal work; the possibility to use international fora to present demands of Civil Society to Governments and international institutions. More information on CCIG’s activities on Decen Work is available here. 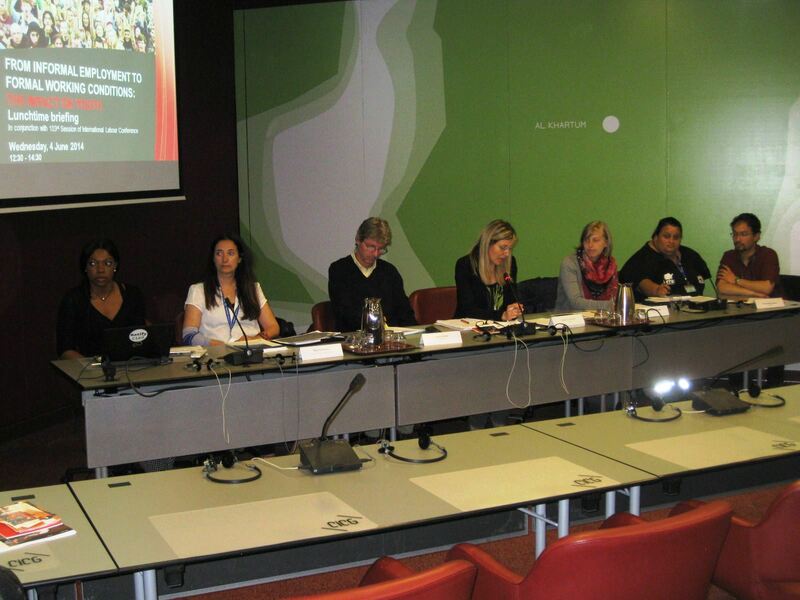 No Comments to "Civil Society to Shine Light on Today’s Economic Challenges Facing Youth – CCIG BRIEFING"